In a large skillet, brown beef, onion and garlic in oil over medium-high heat, stirring constantly, about 5 minutes. Drain off excess oil. Sprinkle roast with cumin, oregano, garlic powder and black pepper. Place in slow cooker. Grate 1 teaspoon lime peel from lime; add to roast along with juice of lime. Add 1/4 cup water; cover and cook on low 7 to 9 hours or until tender. Allow roast to cool in pan juices. Place beef in slow cooker. Sprinkle with salt and garlic pepper; toss well. Add carrots, potatoes, onion, tomatoes, soup mix, basil and marjoram, mixing well. Cover and cook 8 to 10 hours on LOW until beef is very tender. In 3 to 6-quart slow cooker, layer onions. Coat roast evenly with seasoning and place on top of onions with any additional seasoning. Sprinkle with bouillon and top with salsa. Cover and cook on low 7 to 9 hours or until roast is very tender. Cut thin slits in roast; insert garlic slivers. Coat roast evenly with garlic pepper, marjoram and onion powder. In large skillet or Dutch oven, melt butter over medium heat. Cook roast 5 minutes until evenly browned. Place 1/3 cup water in 3- to 6-quart slow cooker. Lightly salt and pepper chicken, if desired. Place chicken in cooker. Sprinkle with 1/2 teaspoon of the marjoram. Add frozen vegetables and tomatoes; sprinkle with remaining 1/2 teaspoon marjoram. Cover. In large skillet cook sausage, stirring frequently, until brown; drain fat. Set aside. In same skillet cook beef until brown, stirring frequently. Add garlic; cook 1 minute more. Transfer to 5- or 6-quart slow cooker. In a large bowl, combine the egg, tomato sauce, rice, green pepper, cracker crumbs and soup mix. Crumble beef over mixture and mix well. Place about 1/3 cup meat mixture on each cabbage leaf; overlap cut ends of leaf. Fold in sides, beginning from the cut end. Roll up completely to enclose filling. Secure with toothpicks if desired. Place cabbage rolls in a 3-qt. slow cooker. Pour V8 juice over rolls. Cover and cook on low for 6-7 hours or until filling reaches 160°. Just before serving, sprinkle with salt and cheese if desired. Makes 6 servings. Combine the onion, ketchup, vinegar, brown sugar, salt, Worcestershire, chili powder, and oregano in a 4- to 6-quart slow cooker. Stir in the ribs. Cook on low heat for 6 hours, or on high for 3 1/2 hours. Using tongs, remove the ribs from the cooker and arrange on a broiler pan. Heat the broiler. Cover and cook on low for 3-4 hours. Baste the chicken. Add parsley. Cover and cook 15-30 minutes longer or until meat juices run clear. If desired, thicken cooking juices and serve over chicken and rice. Makes 6 servings. Sprinkle pork chops with garlic powder, salt and pepper. In a large skillet, brown chops in oil on both sides; drain. In a bowl, combine the ketchup, brown sugar and Liquid Smoke. Pour half of the sauce into a 3-qt. slow cooker. Top with pork chops and remaining sauce. Cover and cook on low for 4-1/4 to 5-1/4 hours or until meat is tender. Makes 4 servings. Cut roast in half. In a small bowl, combine the seasonings; rub over roast. Wrap in plastic wrap and refrigerate overnight. Place the carrots, potatoes and onions in a 6-qt. slow cooker; add broth. Unwrap roast and place in the slow cooker. Cover and cook on high for 2 hours. Reduce heat to low and cook 6 hours longer. Transfer roast and vegetables to a serving platter; keep warm. Pour broth into a saucepan. Combine flour and water until smooth; stir into broth. Bring to a boil; cook and stir for 2 minutes or until thickened. Add browning sauce if desired. Serve with roast. Makes 12-14 servings. Place the mushrooms, onion and garlic in a 5-qt. slow cooker. Top with chicken. In a small bowl, combine the tomato paste, broth, wine, tapioca, sugar, basil, salt and pepper. Pour over chicken. Cover and cook on low for 5-6 hours or until chicken is tender.Sprinkle with Parmesan cheese. Serve with pasta if desired. Makes 5 servings. Brown beef and sausage with onion and bell pepper in a large Dutch oven over medium-high heat, stirring 10 minutes or until beef and sausage crumble and are no longer pink. Drain well. Place beef mixture in a 4 1/2-qt. slow cooker. Stir in tomato sauce and next 9 ingredients. Cover and cook on HIGH 4 hours. Serve on hamburger buns. In a large resealable plastic bag, combine the flour, mustard, seasoned salt and garlic powder. Add pork chops, one at a time, and shake to coat. In a large skillet, brown chops in oil on both sides. Place in a 3-qt. slow cooker. Pour soup over pork. Cover and cook on low for 6-7 hours or until meat is tender. Makes 6 servings. In a 2- or 3-qt. slow cooker, combine the beans, broth, tomatoes, chicken, salsa, corn and seasonings. Cover and cook on low for 6-8 hours or until chicken shreds easily with two forks. Shred chicken and return to the slow cooker; heat through. Serve with rice. Makes 6 servings. Dice the pork and chicken into 3/4 inch cubes. Add the meats, onions, carrots, celery, garlic, tomatoes, spices, and stock to a slow cooker. Stir to combine, layer the sweet potatoes on top, then cover and cook on low for 5-6 hours. 3-4 large boneless skinless chicken breasts, salted and peppered if desired. ¾ cup low-sodium chicken broth (you can also use water)- Only use ½ cup at first, add more as needed. 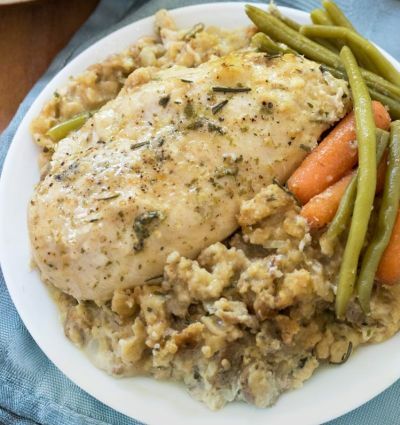 Sprinkle the chicken with salt/pepper/parsley and place on the bottom of the crock pot In a large bowl, mix together the soup, sour cream, stuffing, and half of the water/broth and place over the chicken. (Mix in the optional ingredients as well, if you choose) Lay the stuffing evenly over the chicken. To keep the vegetables separate from the stuffing, place a layer of foil over the stuffing, then place your vegetables on top of the foil. This makes it easier to lift the veggies out and stir the stuffing, if you're able. I recommend stirring the stuffing occasionally to gauge the moisture level. This meal is delicious with some whipped potatoes prepared on the stovetop! This meal is delicious with some whipped potatoes prepared on the stove top!